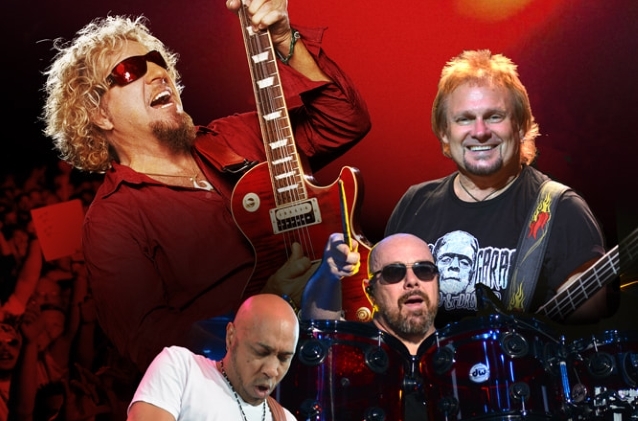 The Desert Classic PGA Tour golf event announced today that rock bands SAMMY HAGAR AND THE CIRCLE and BAD COMPANY will headline the Concert Series after golf on Friday and Saturday evenings on the driving range at PGA West following the golf tournament. The Desert Classic PGA Tour golf event and the Desert Classic Concert Series will again provide fans with a week-long, festival-style entertainment event, bringing together amazing music, great localfoodand the world's best golfers — all on one stage. Kicking off the concert series on Friday night will be Rock And Roll Hall Of Famer and former VAN HALEN lead singer Sammy Hagar and THE CIRCLE performing many VAN HALEN classics as only he can. Rounding out THE CIRCLE is former VAN HALEN bassist Michael Anthony, drum legend Jason Bonham and guitarist Vic Johnson. Rock supergroup BAD COMPANY with the legendary lead singer Paul Rodgers will take the stage on Saturday night performing many of their hits, including "Bad Company", "Can't Get Enough", "Feel Like Makin' Love", "Shooting Star" and many more. The band also includes original drummer Simon Kirke, Howard Leese on guitar and Todd Ronning on bass. "We are excited to bring back our popular golf festival model again this year featuring exciting high energy music, great food, wine, beer, spirits, and world-class PGA Tour golf," said Jeff Sanders, executive director of the Desert Classic and president of the golf event division of Lagardère Sports, the global company that promotes and operates the event. "We are bringing back two nights of music for all to enjoy. The best way to have fun and cap off a great day at the Desert Classic is to rock 'to the hits' performed by the legendary SAMMY HAGAR AND THE CIRCLE on Friday and BAD COMPANY on Saturday nights after golf." Daily tickets to the 60th-anniversary Desert Classic are only $30 and on sale now. All tickets include admission to the PGA Tour golf tournament, concert on the range after golf, the Vons Fan Pavilion on the 18th green, Casamigos Tequila Club 17 and Beers fore Birdies on the 16th green. There are no cover charges or upgraded tickets needed again this year for admission to the on-course hospitality venues or to attend the concerts. For more information and to buy tickets, visit Desert-Classic.com.